With statewide law enforcement officials out in full force to distribute tickets, the National Highway Traffic Safety Association (NHTSA) kicked off its Click It or Ticket Campaign to warn Oklahoma vehicle passengers of the need to buckle up day and night. The message is a simple, yet effective strategy to create awareness about an important issue: seat belts save lives. Our personal injury lawyers in Tulsa agree. With the mobilization of the Click It or Ticket campaign, tickets will be distributed from May 23 through June 5 if vehicle occupants ignore the law and do not fasten their seatbelts. The annual campaign officially began on May 16 and continues until June 5. Included in the campaign are paid ads that target teens and younger drivers as well as anyone who chooses to forgo buckling up. The Click It or Ticket campaign outlines why every vehicle occupant must wear a seat belt, especially at night when more people elect to skip seat belts. Car collisions can be severe if passengers and drivers do not buckle up and often end in deadly consequences. According to 2014 data from the National Highway Traffic Safety Administration, almost 50 percent of vehicle occupants who chose not to wear seat belts died in car accidents. 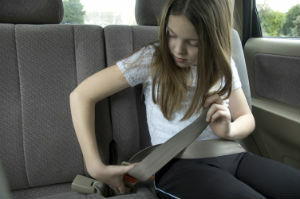 Even though more people buckled up on a national level overall, nighttime fatalities revealed that 57 percent of vehicle passengers who died were not wearing their seatbelts. Click It or Ticket reinforces safety prevention and reminds lawbreakers that police officers will be issuing tickets for violating the state law. Have you been injured in a serious car accident because of a careless driver? If so, speak to an auto accident attorney at The Edwards Law Firm to determine if you are entitled to seek compensation. Schedule a free consultation today.